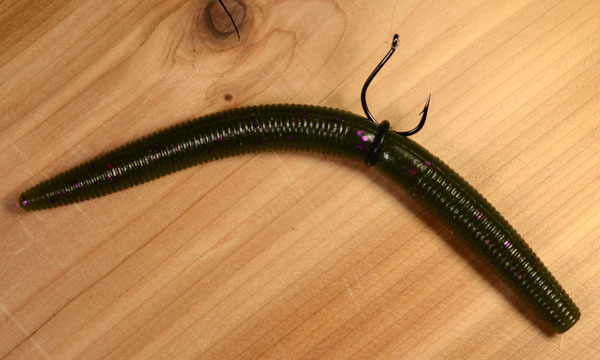 Wacky rigging a Senko style bait is a great technique for both largemouth and smallmouth bass. While I still have a lot to learn about the nuances of this technique the one thing I have learned is that if the fish are biting you can go though a lot of baits in a hurry. Sometimes even one or two strikes is enough to ripe the Senkos apart. 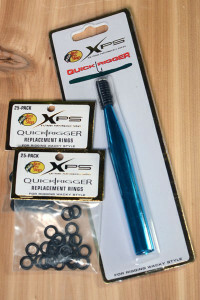 During my winter tackle restocking binge I picked up a Bass Pro Shops XPS Quick Rigger and some extra o-rings. 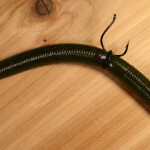 I tested the rig with the supplied o-rings and they work well with my favourite Gary Yamamoto 4, 5 and 6 inch Yamasenkos. Just slide in the Senko into the tube to the desired position, roll the o-ring along the tool and onto the Senko, hook it just under the o-ring. This method should help to extend the useful life of each Senko to multiple catches and should pay for itself in short order. Now I just have to wait for open season to test them out on the water. Largemouth Bass, Product Review, Smallmouth Bass.